Sentle allows you to create custom email states/actions that can be assigned to emails so that your Sentle users can quickly see if an email as been actioned in line with your business processes. Select the ‘Email Sates/Actions’ tab on the left hand side and the list of existing email states will be displayed if any have been created. To add a new email state select the green ‘Add New State’ button on the top right of the window. When selecting to create a new email state the window as displayed here will appear in to which you can add the following information. Name: How the state will show up in the drop down menus when selecting states. Description: This will be dynamically displayed as a tool tip when hovering over an email that has the state applied. Colour: Select which colour you would like the email to be tagged with when the state is applied. When you have finished entering the required details, select ‘Create State’ to add to the list of states within Sentle. You will now be able to select this email state from the drop down menu when editing emails as described earlier in this guide. 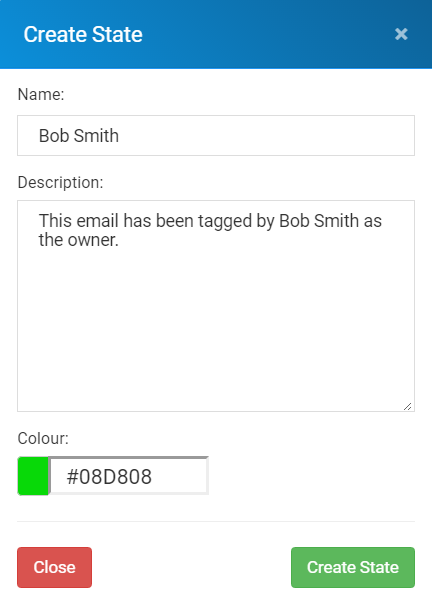 When a state has been applied to an email the email will be tagged with the colour defined when creating the state and a tool top will display details about the specific state/action assigned.